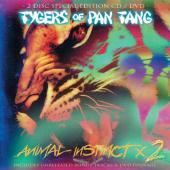 TYGERS OF PAN TANG, do I need to say more? From the bands origins, the group TRICK around 1976, onwards through the major years with MCA, the end in 1988 and the new start in 2004, there has been many classic moments. The foundation, Robb Weir, has always been around; some others have come and gone. Their talent cannot be denied as previous members have become everything from record company owners to lawyers and guitar mega stars. Today the band consists of; Robb and Dean Robertson, guitars, Brian West, bass, Craig Ellis, drums, and the latest addition, Italian vocalist Jacopo Meille. Many are bound to miss both Jon Deverill (ex. vocalist) and John Sykes (guitars, ex THIN LIZZY, ex. WHITESNAKE etc). But how good is the existing band today? Can you recreate what has been? Do the TYGERS OF PAN TANG do that? In the eighties they were a young inexperienced band that marched onwards rapidly – now they are seasoned and know their position. Back then they produced records at the speed of light, now they take their time to make the most of every record. Robb may not be the audience magnet that John Sykes was, but he burns for his band. The album is jam-packed with bluesy hard rock; the riffs are exactly as stuck in the eighties as I hoped. Unfortunately there are no ballads on the album, so there are not too many changes of pace. As always there are a couple of re-recordings. I love it that the TYGERS have realized what an asset “Gangland” is! It was actually the first song of theirs I heard. The football track “Live for the Bay” feels a bit like pub rock but as a whole this is a good album. The lion part of the tracks off the DVD is older. They have been carefully selected, “Hellbound” opens and “Gangland” closes the proceedings. I think that “Love Potion no 9” is getting boring – why not replace it with “Tyger Bay”? The bonus material is a scrapbook from their tours in 2007-08. They are gems in their own right, which also includes songs like “Silver and Gold” and “Running Out of Time”. The whole package feels like you really get your money´s worth, and the TYGERS seem hotter than they have been in many a year!